2016 is almost here and it’s time to start picking your target races and thinking of how you will prepare. You may think it’s early, but now is the time to start thinking about your goals for next year. The earlier you establish the plan, the easier it will be to achieve those goals. When building your long term plan, the initial step is to select the two or three events that are focal points for the coming year. For the sake of the article, we will pick three separate criterium races, each one month apart, starting in May and ending in July. Once the races are selected, take some time to forecast, or plan your time, leading up to the event. From there, break your goal preparation into smaller “periods” of training. Such detailed long term planning is essentially a road map for success. 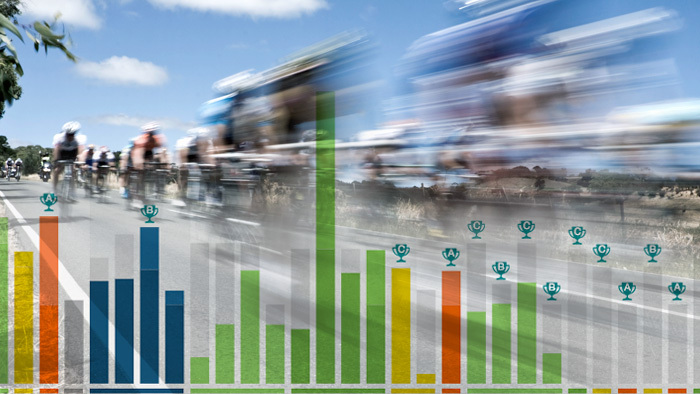 Begin by placing the races in the Annual Training Plan (ATP) feature in TrainingPeaks. Now, do some forecasting; a two-step process. First, do your best to lay out all known life events. Life events are days when you might be able to train, but not with total devotion. Will you be going on vacation? Any business trips or big school projects due? Any holidays coming up? All distractions need to be considered when planning the training leading up to the focus event. Use your main calendar in Training Peaks to post these dates. Try to use such non-bike related events as rest periods if possible. That being said, you can’t plan for everything. Life always throws curveballs. You may have to be flexible and make more adjustments along the way. The second phase of forecasting is to list any criteriums you will do prior to the main goal. Is there a “B” or “C” race you can do? Could doing this race help you prepare from a training perspective for your “A” race? Your “B” and “C” races can also be placed on your ATP. Participating under the pressure of competition gives you a measure of where you are and informs which areas might need improvement. Of course you want a good result, but maybe you compete to simply compare yourself to other riders in the same category as you. When planning “B” and “C” events, make sure you consider the location of the event. Does it require a lot of travel time? Is it worth doing if you burn a few days in the car? Timed correctly, you should have your “B” races two weeks prior to your “A.” This will allow you to fine tune any needed areas. Now that you have your goal races picked, all of your known distractions plotted and your lead-up races on the calendar, it is time to look at your specific race dates and start working backwards. Keep in mind that every three to four weeks of training should be followed by five to eight days of rest. The duration of the training periods and the rest period may vary from athlete to athlete. Some athletes can train for four weeks before needing rest while others build for shorter blocks of time. This difference can apply to an individual’s recovery too, since recovery can be age dependent. The older you are, the longer it takes to recover from a hard day of training let alone weeks of training. Before any structured training is done, you must first have a strong base of training. Your base will serve as the launch pad for all of your structured training. Base building should begin 5 to 8 months before the first focus race. Rest is an important part of this early training and should occur every three to four weeks. Use the TrainingPeaks calendar to plan for this early period of training and rest before your “A” race. With your base in place, begin planning the structured phase of your training two to three months before your first “A” race in May. Design your pre “A” race training in the shape of a pyramid. With the base consisting of Zone 4 efforts and the peak consisting of Zone 6 efforts. Devote two weeks to Zone 4 efforts, two weeks to Zone 5 and one to two weeks to Zone 6. During the final two week build, it is advisable to mix in some short 10 to 30 second all out efforts. Training the top end of your fitness with short intense efforts be the perfect final phase to the training block. Plan a five to seven days rest period before your “A” race. This process can be repeated for each of your three “A” races during the summer. Note that even though you rested the week before your “A” race, it is advisable to take a few extra recovery days after the big event due to its overall intensity. Now that your calendar is set, can you see the map? Use the months and weeks before the big date to base build, rest, train with structure and rest some more. The map will foster success if you stick with two or three goals per season, plan around upcoming life events, know how you are going to train and when you are going to rest. You don’t have to get mired down in all the details yet, simply getting your goals written down and doing a little pre-planning is a great start.